Please welcome today's paranormal guest author Pamela Palmer. Pamela is the author of the Feral Warriors series (Desire Untamed, Obsession Untamed, Passion Untamed, Hearts Untamed, Rapture Untamed, Hunger Untamed, Ecstasy Untamed, A Love Untamed), the Esri series (The Dark Gate, Dark Deceiver, A Warrior's Desire, Warrior Rising), and the Vamp City series (A Blood Seduction, A Kiss of Blood). Pamela: When my youngest was in pre-school. I'd made an attempt at writing a book soon after college, but after the first chapter, I had no idea what to do. I didn't know there was such a thing as classic story structure, let alone know how to find it. What drove me to try again was a daydream that got too big to keep in my head. I started typing it on the computer and managed to get three chapters down before I hit that 'I don't know what to do, now' wall. Fortunately, a brand new library had just opened a few blocks away and as I strolled the aisles, I discovered an entire section of books on how to write. For the first time, I saw the things I didn't know: story arcs, plot points, turning points, character arcs, black moments, and realized I could learn them all. The rest, as they say, is history. Pamela: I fell in love with Star Trek when I was ten and never looked back. Pamela: I would love, love, love to be able to fly under my own power. So I'd probably choose to be a broom-driving witch, or a bird shifter, or even Superman. Pamela: In A Kiss of Blood, book 2 in the story of Quinn Lennox and vampire Arturo Mazza, more is revealed, the stakes become higher, as Arturo begins to realize that he's no longer the male he used to be, that something's damaged his conscience, and what. As Quinn starts to come into her sorcerer's power, and Arturo becomes determined to protect her, the dynamic between the pair changes dramatically. Pamela: Hmm, I'm not very good at choosing actors and actresses--I rarely know who plays what. But I love Julia Stiles and I think she'd make an awesome Quinn. For Arturo, maybe Ian Somerhalder. Arturo's friend, Kassius, would be Joe Manganiello (Alcide on True Blood) all the way. He was my inspiration for the character of Kassius, a werevamp. 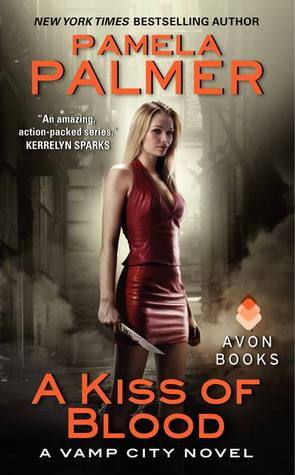 A Kiss of Blood (Vamp City #2) by Pamela Palmer. Release Date: June 25, 2013. Thank you Pamela for joining us here today at From the Shadows! To learn more about Pamela Palmer and her books, please visit her website.